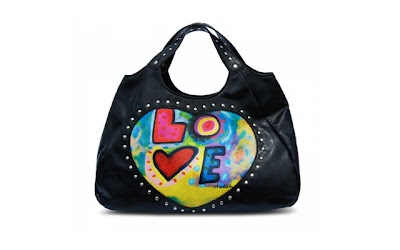 When I first laid eyes on the Susan Nichole Love Bag in Yellow, I was infatuated, but I was not quite "in love." I have always wanted to own a yellow bag, but have never found one that I liked enough to make me take the leap. Now that Susan Nichole has introduced two new colors in The Love Bag for Fall 2011, I think I might be able to call it "true love." The two new colors offered in this bag are a metallic Eggplant and a Black. I have to say that I am partial to the Black because it frames the playful colors in the heart very well. One of the reasons why the Yellow does not work for me is because the studs are goldtone, whereas on the new colors, the studs are silvertone. The Love Bag is the perfect size for me at 14"W x 8-1/2"H x 5"D. Both the Eggplant and the Black can currently be pre-ordered, but will be available soon towards the end of July. This style of vegan handbag retails on SusanNichole.com for $95.